Sales Lab Posts: Makers – The Future Is Now! 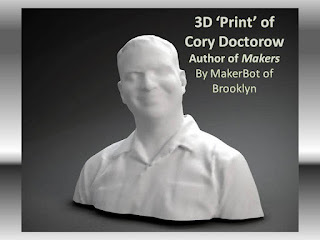 Makers is a future business fantasy by Cory Doctorow with the view of a society where traditional business structure has broken down and the economy is in the tank. Sound familiar – like what you read in today's newspaper? Instead of relying on organizations to provide jobs, plan what to do and produce, and sign paychecks on regular intervals - in Makers, individuals or a few collaborators are making and selling things. Others are buying things that meet a need with a value to the buyer. For raw materials, makers reuse already manufactured parts from discarded items – junk – adapted for innovative uses - much different from their original purpose. They focus on what users want and need to make something to fill that void, by adding some dreams and ingenuity. As inventors, impossibility just a challenge; as entrepreneurs, simplicity and low expense are core principles. In the book, makers reused boogie-woogie Elmo parts to make smart cars, created 3D printers, and developed self-replicating machines (machines that make working copies of themselves). Rewind the tape to present day. Today we have self driving cars in prototype (Nevada has approved these cars) and self parking cars are in the showroom of five major auto brands. Machines that can make copies of their parts exist now – development of self-assembly is moving closer to self replicating reality. When Xbox came out with the Kinect to sense game player movement – tinkerers immediately bought them to reuse the components to create cheap 3D imaging capability for the home PC. The old Heath Kit and Erector Set crowd of tinkerers is still around, but has evolved to an open-source knowledge-base approach of developing innovative ideas. Code, concepts, and applied experience are shared and this collaborative environment fosters creativity and permits people to develop their ideas into products or services for sale. One of the most visible maker communities today is app developers – individual coders who find a need and create a smartphone, tablet, or computer application to fill the void - “I have an app for that”. Agile, quick, and effective in satisfying user wants, priced cheap, and available directly to the buyer. The New Normal is the changed structure of how we do business. The individual now plays a more significant role in the 'how' of business than merely being a cog in the machinery. However, because of the rapidly changing reality, we must keep current and continue to learn and evolve to remain viable in the workforce. To learn about the current business environment, read Makers – a book about the future. Even its distribution is non-traditional...download it free from the internet. The future is now. How do you see it? When I started reading Makers, I thought it was a future business fantasy. Then, I kept recognizing the people and situations in it. Now I think it is a view of right now uncluttered with my preconceptions of the way things are 'sposed to be.